Breakfast is the most important meal of the day, especially if you’re away from home, so you should take time. At Smile & Co, we propose you to take a well-deserved break, as it gives you a good start to a full day of sightseeing. 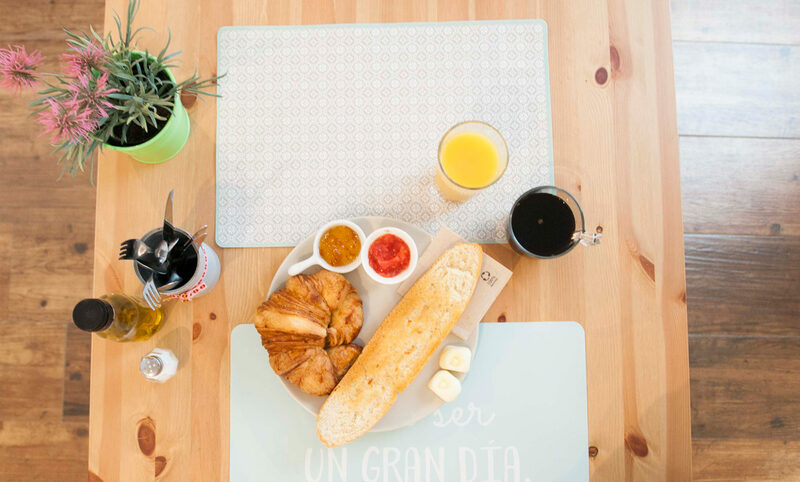 You could start the day with energy, because we propose a full Mediterranean breakfast that we prepare for each of our guests. Orange juice, coffee with milk or other hot drink, croissants, Spanish toast with oil and natural tomato or, if you prefer, with butter, jam, cheese or ham.You can also accompany it with yoghurt and cereals.. But the best of the breakfast at Smile & Co is the exchange we have with you. This is the perfect time to tell our guests the sights of our city and our province as well as the best addresses for meals. A good discussion to clarify doubts or recommend routes is always helpful. Remember that our philosophy is that you are at home, so take the time to ask for advice for your day, we will be happy to help you.